I’m sure that at least once you wish you had one big picture instead of 2 smaller ones – you always have to explain how that car was next to that shop and switch from one photo to another all the time. Or maybe you have a “before” and “after” type of situation, when a merged photo would be in handy. 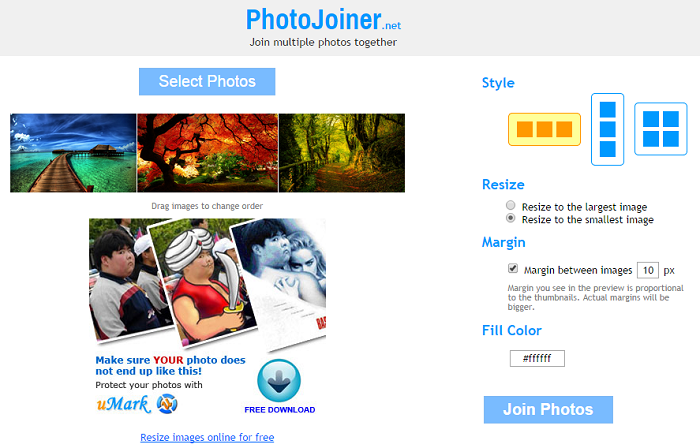 But now we have a solution – photo joiners. You’ll see how things will get easier if you start using these web apps (yes, you don’t have to download anything, it’s all online). Style: it gives up the possibility to join the photos one on top of the other, one next to each other or in the form of a grid. Resize/Grid Options: if you go with one of the first two styles, then here you’ll have resize, with 2 choices to resize to the smallest or the largest image. If you go with the last style, you can choose how many rows and columns should the grid have. Margin: you can leave a space between the photos of as many pixels as you want (what you see in the preview is not the real deal because the margin and thumbnails are smaller). 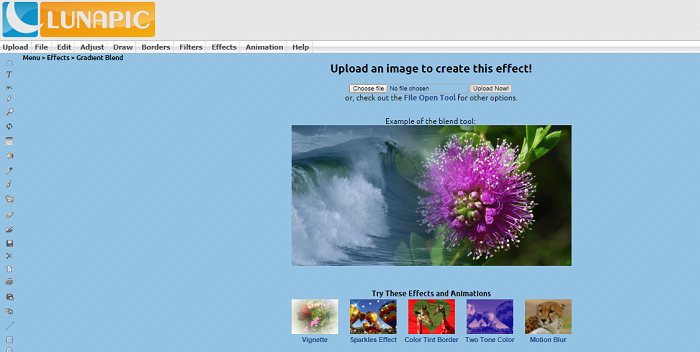 That’s pretty much it with PhotoJoiner, it’s no Illustrator; it does what its name says: joins photos. 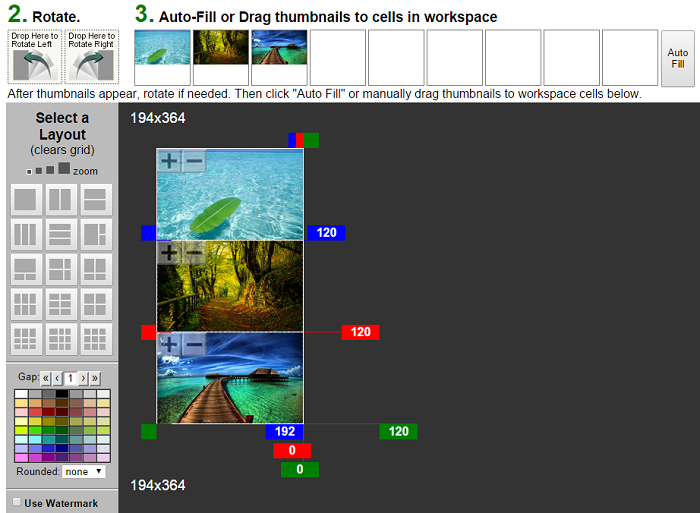 Although it looks complicated, QuickPictureTools is accessible to anyone who takes a minute to have a look at all the buttons and options. You can add up to 4 images and instead of one button it has four, for each slot available. Once you add them, everything becomes clear – you can change the height and width, add padding between them, create round corners or select another background color. The best part about this is that you can add text on top of everything. You can select the font, size and color and move it around just by drag and drop so they made it easy for everyone. 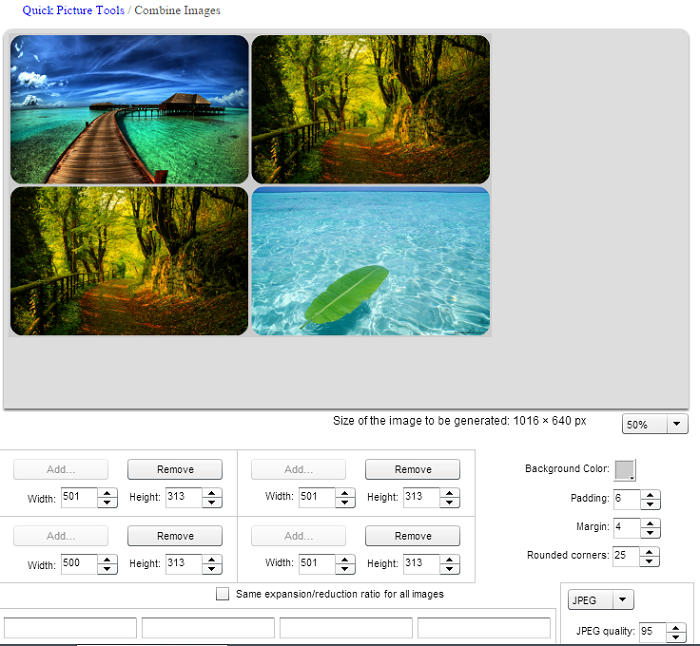 You can export the final version as a PNG or JPEG – the latter one will also give you the option to select the quality. Although they could improve the interface, it’s a good and easy to use app that will get the job done. Fotor is a known brand and their products are usually well-made so we’ve had high expectations of this one also. The photo stitch app can be found in their menu under features, collage – it actually works more like a collage. After you launch it, although the screen is full of buttons, you’re not overwhelmed; you have the feeling that everything is where it should be. On the right you have the add photos button – Fotor is the only one that gives you the option to add photos from different sources, like Flickr, Picasa, Facebook or Dropbox. Also it’s the only one that has different patterns based on the number of photos. You can even arrange them under a shape – it has tens of them, from animals to hearts, under different categories and forms. Like the other apps, it lets you add padding if you want or round corners, just that in our opinion every effect looks better here – this is why Fotor is a brand. This is like an old school editor, but I’m not saying that in a bad way. You can upload up to 9 photos, but you can’t select all of them at once, you have to click “choose file” for every photo uploaded. You have the instructions on the right side of the screen but you don’t really need them as everything is pretty straight forward. After the upload is done, you can rotate the photos if you need, if not you just have to drag and drop them to your “working area”. 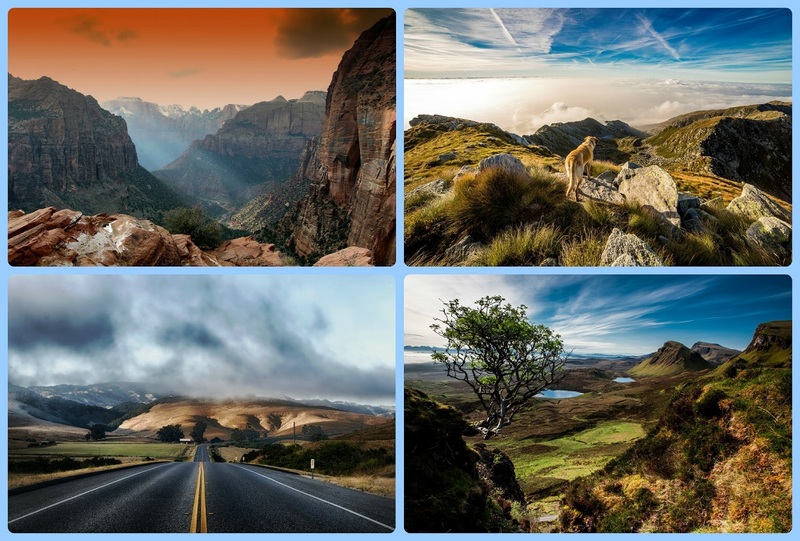 This can be organized in 15 different ways using the predefined layouts and each photo will go into one of the layout’s slot, with the possibility to zoom in or out on each one individually. The best feature of Zippy is that it gives you the option to save the photo using a predefined size – for example you can save the final version as an eBay standard photo. LunaPic is another website, besides Fotor, that’s known around the world for its wide variety of online services, but the blender option is not the best of them. Somebody once said that simple equals efficient – in this situation it means that it doesn’t get any more efficient than LunaPic. This is more like a photo blender and the only thing you can do is upload the photos and then drag them around until you find the right position and save it. That’s it, no background, no padding, no sizing, nothing. If you try their new blend tool, you’ll find transparency, shape and edge fade pixels as available options, but these are not very useful. Although it’s not the best thing they did, I still appreciate LunaPic for adding this to their portfolio since there are a lot of people using their website and they can do this without having to find another tool.